Providers who follow the mold to populate electronic patient charts are at risk of producing inaccurate medical records. Copy-paste, copy-forward, macros, defaults, and templates are handy time-savers for physicians who don’t enjoy typing paragraphs to populate patient EHRs. However, hidden dangers lurk within these shortcuts, enticing unwary providers into producing documentation that can be confusing at best. At worst, the maneuvering could violate HIPAA privacy rules, invite federal and payer audits, and leave doctors vulnerable to accusations of fraud and malpractice. It’s important that HIM professionals understand these risks so coders, analysts, and others who review records can spot the red flags of misuse. HIM is in the best position to spearhead the development of documentation guidelines and training programs to educate providers on the appropriate use of copy-paste and related functionalities. 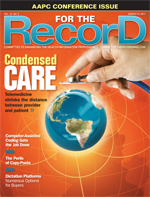 A particularly risky practice is copying from one patient’s record to another, says Warner, because it can result in a HIPAA violation if the copied text includes the original patient’s identifiers and the record is released. Levinson has observed that during follow-up visits, providers may copy-paste or copy-forward past, family, and social history from the first visit in lieu of documenting the course of the illness since that time. Then they claim that they asked all the questions again even if they did not. Is there a place for copy-paste in compliant documentation? “I see no role for copy-paste, copy-forward, or documentation by exception in the medical history or the physical examination,” says Levinson. “It cannot be done compliantly or compatibly with quality care.” When it comes to past, family, and social history and review of systems, he suggests physicians can save time by having patients complete forms using a digital pen that uploads information into the EMR. The physician then only needs to review the information and drill down with questions. The guidelines, which were distributed during EHR go-live training and are currently being piloted during residents’ training, may be formalized into policy and used to train all attending physicians. Meanwhile, HIM professionals are at the forefront of the battle to identify and stamp out abuse. “Rather than adding another layer of resources to audit records, it’s very important that we encourage chart analysts, coders, and others who are reviewing charts to help highlight potential problems,” says Proffitt. “Be proactive and conduct audits,” says Warner, who admits this can be difficult because there often is no audit trail with copy-paste.